"It ain't what you made, it's what you saved." 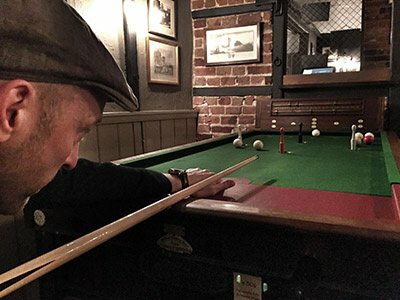 The Norwich Bar Billiards League is made up of 12 teams split in to two divisons based around 6 venues. The matches are played in a friendly, informal manner but the rivalry between the teams can sometimes be fierce! As well as a team league that runs through out the year, there is also a singles knock-out tournament where individual players can put their skills to the test as well Cup and Plate competitions. 16/04/19: Singles Tournament Finalists added. 25/03/19: 2019 AGM notes added. 22/03/19: 2019 League fixtures and Cup/Plate format added. About and Venues pages updated. 20/03/19: Singles Tournament Quarter Finals fixtures added. © 2019 Norwich Bar Billiards.